Fact or fiction? Is Clutchy Hopkins an alias? Or is this the true name for a reclusive musical powerhouse? Are his recordings vintage, new, or a mix of both? Some may wonder about these things, along with why some dudes have a long pinky nails or whatever happened to myspace, others may ask if any of this really matters? While the mystery surrounding the artist is no longer news, the music only gets better, maturing like a fine wine. 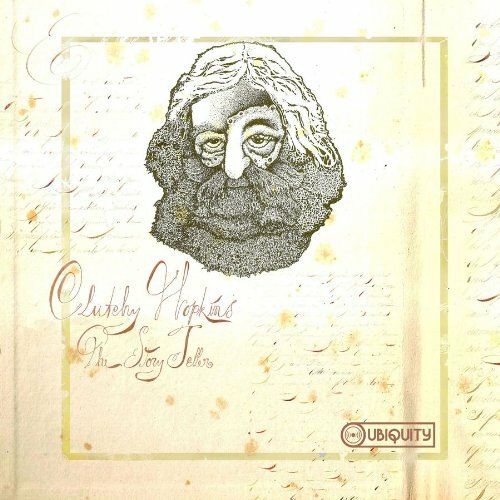 This album was delivered to Ubiquity HQ on a beaten-up iPod, which was wrapped in what looked like ancient scroll, but turned out to be two paintings of Hopkins by Spanish artist Thabeat Valera. One painting is the album cover, and the other will feature in the booklet. The iPod included all of the album tracks, plus a reading of the story behind the recording, repeated in 10 different languages. It’s the most varied Hopkins album to date encompassing lots of vocal textures, and a dash of worldly vibes. Check the Brazilian-psyche-like “No Contact…Contact,” and the mad spooky science of “Miles Chillin,” or the shuffling “Thinkin’ of Eva” which would sound perfectly at home playing in a Parisian café. It’s an album influenced by Hopkins time in jail, where, while in the courtyard, he met many international prisoners waiting to be deported. Lo-fi, acoustic, finger- snapping, hand-clapping, whistle-and-hummed jam sessions gave Hopkins the ideas which he later put to tape.